The PADI Rescue Diver course is the foundation for leadership level training and is an excellent way to develop your diving skills as you prepare to help others. A combination of classroom and open water training, the course focuses on a number of simulated dive accident scenarios to develop your rescue skills and techniques. 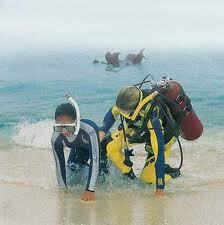 When you are done with this class, you will be a more confident, capable diver. Prerequisite: Advanced Open Water and current CPR/First Aid Certification. Participation in both weekends is required for certification. Price includes all instruction and certification processing. Does not include academic materials, equipment, or park entrance fees. View our Rescue Diver Course Information Sheet for additional details. Call for more information or register below.